Whether your preference is a rail-trail with a gentle grade, or rolling hills and picturesque valleys, the Heritage Area has roads and trails that provide wonderful bicycling experiences. For those who prefer challenging trails suitable for mountain bikes, several of the Heritage Area’s state parks and other area trails are great for off-road adventures. 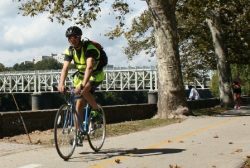 If you’re looking for a bike ride that is suitable for all members of the family, try the Schuylkill River Trail. Built primarily on an old railroad line, the trail is flat and well-maintained. It will one day extend the entire length of the river, from Philadelphia to Frackville, a distance of about 120 miles. Today there are over 75 completed miles, built and managed in sections by different organizations. Visit the Schuylkill River Trail section for maps and more. Below is a breakdown of the Schuylkill River Trail’s sections. Schuylkill Banks. This park and greenway in Philadelphia extends from Fairmount Water Works to Locust St. It is very popular and heavily used. Philadelphia to Mont Clare. This 26-mile section is mostly paved, and runs through a variety of landscapes. Valley Forge National Historic Park can be accessed from the trail, and Manayunk’s trendy restaurant scene make it a popular destination for cyclists. This section of trail can also be used to access other trails such as the Perkiomen Trail, Audubon Loop at Oaks and the Cross County Trail at Conshohocken. Cromby to Parker Ford. This is the newest section of trail, opened in December 2011. It measures 5.6 miles, beginning in Cromby, just west of Phoenixville, and ending in Parker Ford. Plans call for extending that piece of the trail several more miles to connect with the Pottstown section. Today, it is a popular segment, mostly crushed stone, but paved in some spots. Pottstown to Reading (Thun Section). This 19-mile piece begins at Pottstown’s Riverfront Park, where it is paved, and follows a tree canopied path through Berks County, where it is crushed stone and known as the Thun Trail. There is a scenic 4.5-mile on-road section in Birdsboro, and several old railroad bridges offering up beautiful views. It ends at Reading Area Community College. Bartram Section. Located in Upper Berks and Schuylkill County, it stretches from Hamburg to Auburn. This is a particularly scenic piece of trail, especially in spring and early summer when wildflowers are in bloom. Reading to Hamburg. Currently this is a 20-mile signed, on-road sectionl that provides cyclists with a route to travel beyond the trail’s end in Reading. An off-road Reading-to-Hamburg route will be constructed as land and resources become available. Mountain bikers will find that many of the region’s state, national, and local parks offer great biking opportunities. French Creek State Park, in Chester County, Blue Marsh Lake in Berks County and Wissahickon Valley Park in Philadelphia are all have popular mountain biking trails. Bikes are not permitted on any section of the Appalachian Trail. Road bikers will enjoy traveling many of the region’s back roads as they wind their way past farm fields and small towns and villages. Three official BicyclePA routes cross the Heritage Area and are well marked on local roadways. Beware that some of these routes run along busy roads, and may be suitable for experienced cyclists only. Route E runs 52 miles in PA between Trenton, NJ and the Delaware State line. Route S is the longest bicycle route in PA and runs east-west through Berks, Chester, and Montgomery Counties. Route S intersects with Route L near Hopewell Furnace NHS and French Creek State Park. Check your bike regularly. Make sure the tires are full, chains are greased, and the brakes are tight. Always wear a helmet, both on the trail and on the street. Obey all traffic signals and ride with the flow of traffic. Stay off sidewalks in business districts and where prohibited by ordinance. Please be aware that it is illegal to ride a bike on any sidewalk in the City of Philadelphia. Wear the proper attire for the type of biking you plan to do. Check the weather before your trip.